Definitive chemoradiotherapy (CRT), used for treatment of patients with an initial diagnosis of unresectable locally advanced esophageal cancer, has led to unsatisfactory long-term prognosis. Moreover, CRT can lead to esophageal fistula, perforation, and strictures. Therefore, strong induction chemotherapeutic treatments are necessary to reduce the tumor volume for subsequent radical esophagectomy. This study aimed to determine the oncological utility of docetaxel plus cisplatin and 5-fluorouracil (DCF) and the technical feasibility of subsequent esophagectomy for locally advanced esophageal cancer. Eighty-seven patients with clinical borderline unresectable T3 and T4 esophageal squamous cell carcinoma without distant metastases were included in this study. There were 44 patients in primary DCF group and 43 patients in definitive CRT group, and perioperative and long-term oncological outcomes were compared between the two groups. Twenty-two patients (50%) achieved R0 resection in the DCF group. Albeit not significant, the rate of curative treatment was higher in the DCF group than the definitive CRT group (p = 0.099). The overall survival (OS) and progression-free survival (PFS) were better with DCF than with definitive CRT (median OS, 29 vs. 17 months, p = 0.206; median PFS, 10 vs. 6 months, p = 0.020). Specifically, the OS of patients with a Charlson score of less than 3 among the DCF-treated patients tended to be better than those among the definitive CRT-treated patients. DCF and subsequent esophagectomy achieved R0 resection in 50% of the patients and was associated with better long-term oncological outcomes in patients with initially unresectable esophageal cancer if their systemic status is acceptable. Masashi Takeuchi and Hirofumi Kawakubo have contributed equally to this study. The online version of this article ( https://doi.org/10.1007/s00268-019-05000-3) contains supplementary material, which is available to authorized users. 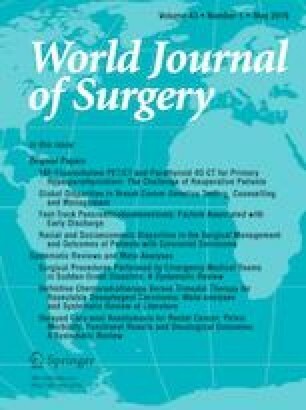 The authors thank Kumiko Motooka in the Department of Surgery at Keio University School of Medicine for her help in the preparation of the manuscript. Yuko Kitagawa have personal fees from sanofi K.K, personal fees from ETHICON PART OF JOHNSON AND JOHNSON FAMILY OF COMPANIES, personal fees from Medtronic Japan Co., Ltd., grants from KYOWA HAKKO KIRIN CO., LTD, outside the submitted work.